Prosper Utseya's career-best 5 for 36, which included a hat-trick, was enough for Zimbabwe to bowl South Africa out for just the fourth time in the two countries' competitive history, but not enough to pull off an upset. On a surface where spinners claimed 11 of the 20 wickets to fall, neither side's batsmen were able to settle but Zimbabwe's proved more brittle. With breaking points at the top, in the middle and at the bottom of their line-up, Zimbabwe could not muster the runs to match a South African XI that was without one of its best batsmen. AB de Villiers was rested for the second time in a week and it seemed South Africa would be made to rue his absence when Zimbabwe reined them in from an opening stand of 142 to conjure a collapse of 9 for 53. But Zimbabwe went one (or many) worse. They lost their last five wickets for 32 and the five batsmen who managed starts could not convert them into anything more substantial to leave them with the same concerns they have had over the last fortnight. In the batting department Zimbabwe continue to lack, but their bowling, even without suspended Tinashe Panyangara, prospered. They were able to redirect South Africa after they seemed destined for a third score of over 300 on this Zimbabwe tour. Hashim Amla and Quinton de Kock took more risks than usual but they got away with it. Amla offered a return catch to Brian Vitori in the fifth over and could have been run out twice before he reached 25 while de Kock also relied on fortune. He had a chance drop short of cover and was lucky to see an inside-edge scream past the offstump for four. Once they settled, de Kock targeted Elton Chigumbura's short ball and reached his fifty off 45 deliveries to take the pressure off Amla, who slowed down after the early rush. Amla's half-century came off 70 balls and by then both he and de Kock knew they would have to be more watchful because turn had become a factor. Sean Williams beat the bat almost immediately and Nyumbu produced flight and zip in his second spell. But it was only when Utseya was introduced brought on that serrations began. He made the initial breakthrough when Amla came down the pitch to one that turned into him, was beaten and found well short of his crease to provide Brendan Taylor an easy stumping chance. Then Utseya plucked through the South Africa's top-order and ploughing into their middle to allow Zimbabwe to dictate proceedings. De Kock squandered the chance to anchor the innings when he tried to reverse-sweep Utseya over short third man but was caught by a one-handed, leaping Chatara just outside the ring, Rilee Rossouw's first-match first-ball duck was repeated in his second game when he prodded tentatively at a tossed up ball to edge to slip and David Miller was rapped on the front pad when he played for non-existent turn. 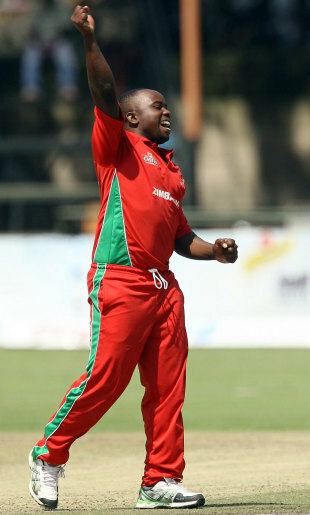 Those three wickets in three balls made Utseya the second Zimbabwean to claim a hat-trick after Eddo Brandes, in 1997. South Africa still had Faf du Plessis and JP Duminy at the crease and would have looked to them for a recovery but Zimbabwe were wise to the possibility and quickly shut it down. Utseya and Williams tied South Africa down and tangled them in turn, while generously tossing it up to tempt as well. Zimbabwe sealed off the boundary for more than half the South African innings and batsmen fell either in frustration or when following flight. Duminy was out lbw when he played outside the line to give Utseya his fifth and du Plessis chipped Nyumbu to midwicket to leave the lower order on their own. Ironically, it was up to South Africa's spinners to take them out of trouble. Imran Tahir and Aaron Phangiso's last wicket stand of 36 pushed South Africa over 200 and gave them something to defend. Before either of the tweakers were needed, Zimbabwe's opening stand was broken. Tino Mawoyo was run-out in the third over to leave Stephen Mangongo with ever-more questions about who best to use at the top. What he will know is that Sikandar Raza is a keeper, but needs to convert. Yet again, Raza showed promise, pounced on width and dealt with the short ball impressively before giving it away later on. When he was batting with Hamilton Masakadza, Zimbabwe took the fight to South Africa with aggressive boundary-hunting before Phangiso wrested it back. He was introduced in the Powerplay and with his fourth delivery - the arm ball - found the gap between Masakadza's bat and pad to peg back legstump. Taylor left the same gap and was bowled in the next over, with his offstump knocked back, to prolong a lean run for the former captain. Taylor's dismissal allowed South Africa to keep Zimbabwe quiet with just 24 runs coming from the next six overs. Situations like that are where Raza should show patience but he did not. Imran Tahir had been brought on the over before and Raza had assessed his tendency to flight it but still tried to launch him over long-off and ended up holing out. South Africa could have sealed the deal three overs later when Malcolm Waller edged Kyle Abbott but the ball went between de Kock and Amla to give Waller a second chance. He went on to share in the biggest partnership of Zimbabwe's innings, 46 with Sean Williams, but succumbed to the short ball to leave Williams to be the hero. Williams threatened with confident strokeplay off the front and back foot but threw it away when he flicked Ryan McLaren to Amla at midwicket. With that, Zimbabwe hopes faded and when McLaren picked up two wickets in successive balls two overs later, they disappeared altogether to condemn them to a seventh straight defeat.